Imagine you are hurtling along a precariously twisting mountain pass in a obnoxiously painted camper van going more or less 100 Km/h. 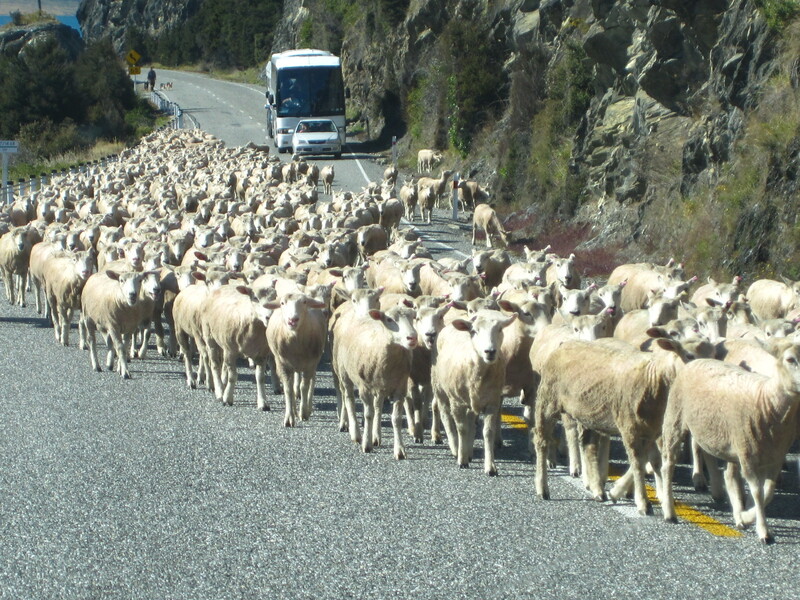 All is right in your scenic world until, without warning, a massive herd of hundreds of sheep is seen running – yes, running – across the entire highway and straight toward your car. This, my friends, is a very disconcerting moment. After collecting ourselves, and putting the Sparrow back in gear, we plodded forward – slowly – and gave the sheep herder and his sheep dogs at the rear of the pack a nice wave. The highway, it should be noted, was covered with little lamp poops. Introducing, My “Little Sparrow” New Zealand, Could You Be Prettier?! I AM Wine! Ahh … I saw this in the west of Ireland, too. It is startling when you first see it, isn’t it? It’s probably a great way to keep speeds down since you never know what’s around the next bend. Haha, great picture! This happened to me in the Alps in Austria – but with cows. The darn things won’t move no matter how hard you will them to git with your car horn.